Nestled within the heart of the scenic Sierra Nevada mountain range, Lake Tahoe has developed a national reputation as the ultimate mountainside vacation destination. All year long, you can absorb the beauty of these striking geological figures that jut into the horizon, whether from a distance or up close and personal. And, while it’s nearly impossible to avoid witnessing mountain views when you’re in Lake Tahoe, no one can deny that nothing gives you the full impact of immersing yourself in a mountainside retreat like staying somewhere with an unbeatable view of the mountains. Continue reading on below to learn more about the incredible mountain view Lake Tahoe homes for rent that Tahoe Signature Properties has to offer for your stay! 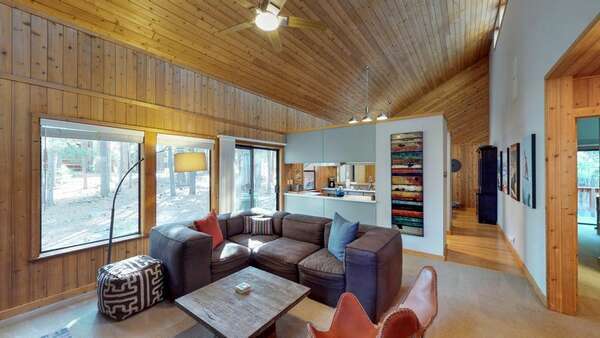 When you choose to book one of Tahoe Signature Properties elite mountain view Tahoe Vista vacation rentals, you can have the supreme mountain vacation experience. Look out your window and you’ll see the peaks of the Sierra Nevada, just beckoning you to explore them like the pioneers did so long ago. Depending on the time of year that you decide to visit Lake Tahoe, you can ski or snowboard down their snowy slopes, or ride scenic chairlifts to iconic hiking spots that allow you to gaze out over Lake Tahoe’s shimmering depths and the lush forests that surround it. On the inside, these wonderful mountain view Tahoe home rentals themselves provide all of the conveniences of home during your time here. Space and privacy abound, unlike what you would encounter in a hotel setting. You can also enjoy vast rooms, full kitchens, appliances, and even community amenities that add a special touch to your alpine vacation. As for things to do, Lake Tahoe is particularly famous for its spectacular skiing and snowboarding each winter, with some spots in the area receiving as much as forty feet of light, dry, and powdery snow on average every year. However, the extensive trails on these mountains designated for hiking, biking, and horseback riding during the warmer months are equally beautiful and captivating. No doubt watching all those great mountain views from the windows or front porch of one of our Lake Tahoe homes for rent makes your feet itch for a good hike. Well, you’re in luck, because the Sierra Nevada wilderness has some of the most fascinating trails that you can find in this part of the country. And the best way to explore it and enjoy all the flora and fauna is on foot. You have many options. You can either hike up and reach elevations of about 10,000 feet above sea level, or hike down as you make your way to the beach. As the networks of trails cross paths, it’s easy to get lost both literally and figuratively. It’s so beautiful and the trails go on for miles; you can lose all sense of time and direction and end up lost. It’s always a good idea to print out a map of the trail you plan to explore before heading out the door of one of our Tahoe home rentals. Around the time spring melts into summer, the golf courses come back to life. And not a moment too soon, as golfers have been counting the days for the golf courses to open their doors. You can choose from six championship golf course and four executive courses. And if you like to explore more down the North Shore, there are 14 more golf courses waiting for you. So you can easily say that golf is a big thing around Lake Tahoe. With courses that hug the lake and others that zigzag around the valley, one thing is for certain: the views are astounding. If you want to play on the mountain, Coyote Moon Golf Course, with its 250 acres of hills and pine trees, is the right one for you. When you want to explore the mountains but at a faster pace than hiking, a bike is the right transport. Lake Tahoe has some of the most challenging biking paths and mountain trails you can find. Tahoe East Shore Trail is one those trails that everyone passionate about biking should try. Find your way between boulders on the rocky trail and feel the thrill of a challenging path that will make you sweat, and not just from the effort. It goes from Incline Village all the way to Sand Harbor in one long adventure. Another trail that is worth looking at is the North Lake Tahoe Ale Trail. Contact our dedicated team of reservation specialists to find out additional information about our Tahoe Vista vacation rentals with mountain views, in addition to the other lovely properties that we have available all around the Lake Tahoe area.